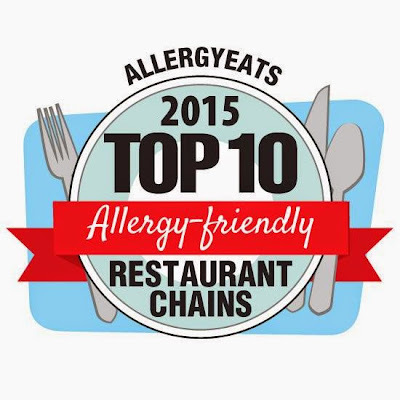 Once again, Allergy Eats has released their list of the top restaurant chains for individuals and families with food allergies based on real customer experience and ratings via the Allergy Eats app. I must point out that this list only includes chain restaurants (you won’t find your favorite local family-run restaurant here). Also, note that the ratings (out of a possible score of 5.00) are actually higher for the small chains than the large chains. As I noted, the list doesn’t differ considerably from last year… or the year before. I can argue that is a good thing. If there is one thing I look for in a restaurant when eating out with food restrictions – after safety and honesty – it’s consistency. There is something very comforting about being able to order my “bacon burger with a lettuce wrap/no seasoning on the fries” week after week at my local Red Robin and know that it will be prepared properly. And yet, I’d love to see more newcomers to this list. I must try Mellow Mushroom when I travel south! 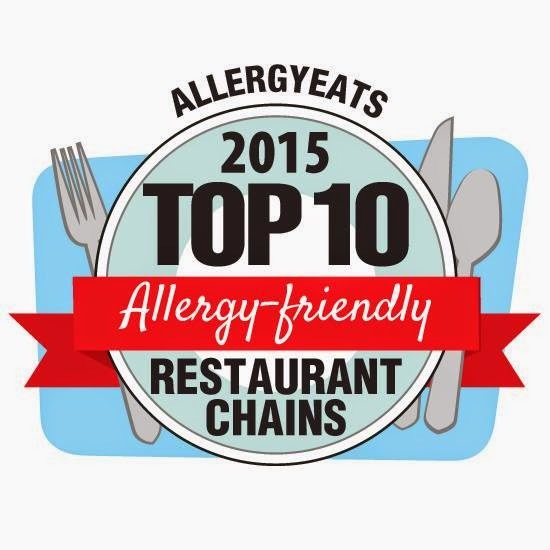 View the full announcement post at Allergy Eats, and don't forget to rate a few restaurants while you are there.